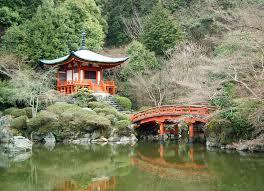 Kyoto is just one amazing thing after another. Honestly, I don’t know where to start or end. So much here is full of meaning and humanity. My only regret is that I am barely scratching a very small part of a very big surface. The big event for me was the Godai-Rikison Ninno-e Festival at Daigo-ji (“ji” means “temple” and the temple complex is another UNESCO World Heritage Site 🙂 ). 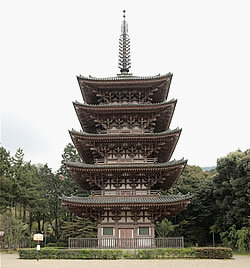 Daigo-ji is Zen Buddhist, like most Buddhists in Japan. 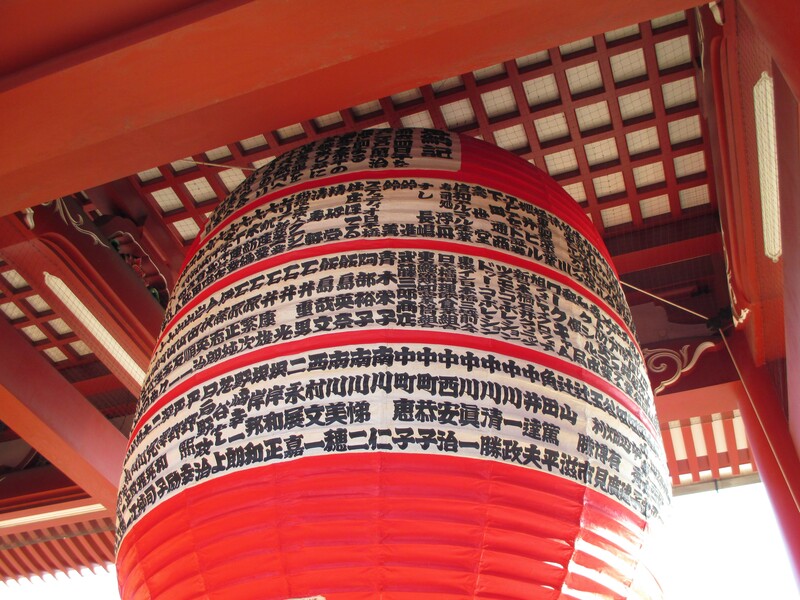 The name of the festival means “Contest of Strength” and celebrates five Buddhist gods, peace and personal good fortune. 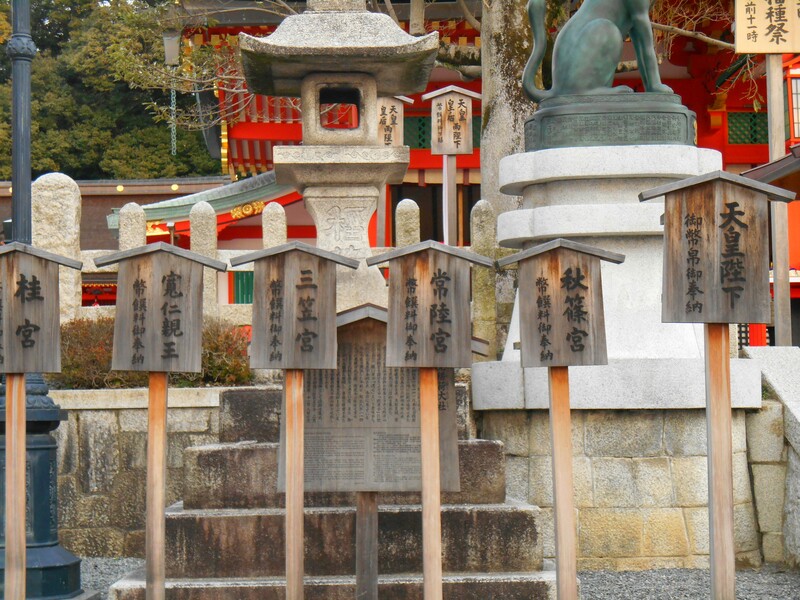 It has been celebrated for more than 1100 years and apparently only at Daigo-ji. The festival engages all of the senses with chanting, taiko drumming, candles burning, incense, street foods sizzling on grills, bond fires, monks in traditional costumes, brightly colored banners, worn wood floors on naked feet, praying and, of course, the grunts from people trying to lift 300 pound rice cakes. 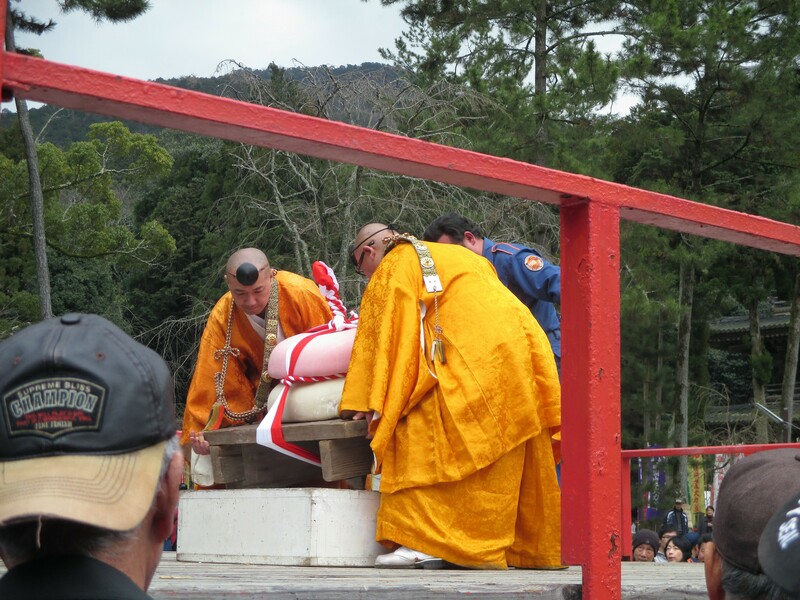 These two monks are supervising the rice cake lifting contest. The man in the blue jacket behind them was one of the contestants. I didn’t know people still wore caps backwards. 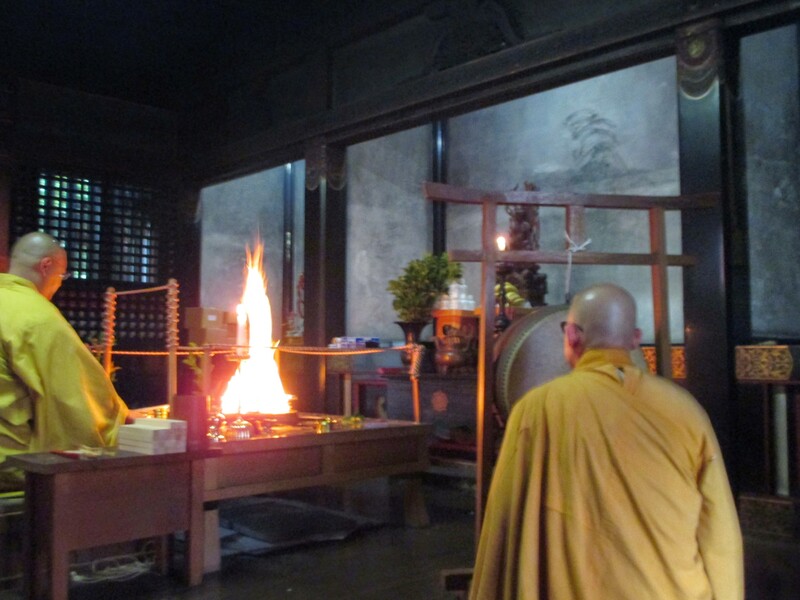 In one of the smaller temples, a monk fed a small bonfire to the beautiful sound of a taiko drum. 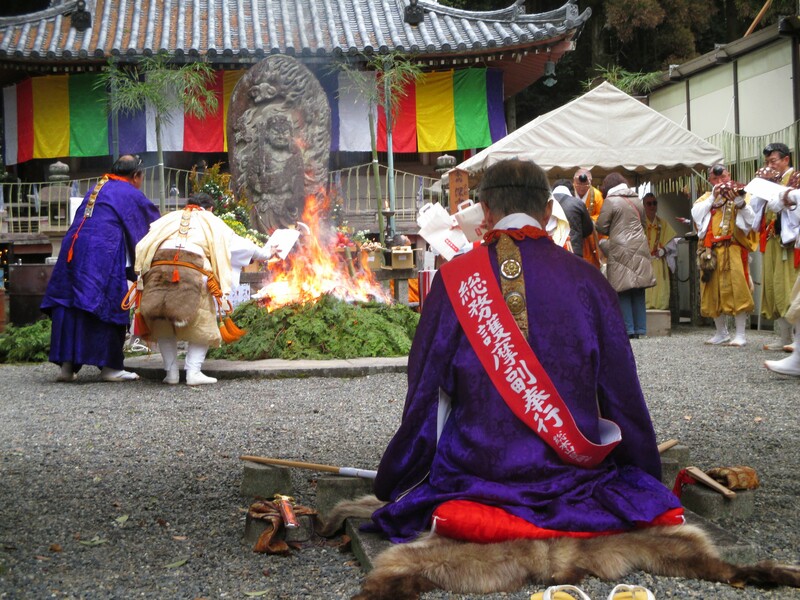 This ceremony involved fanning the flames of a bond fire with fortune papers belonging to festival guests to ward off bad luck. 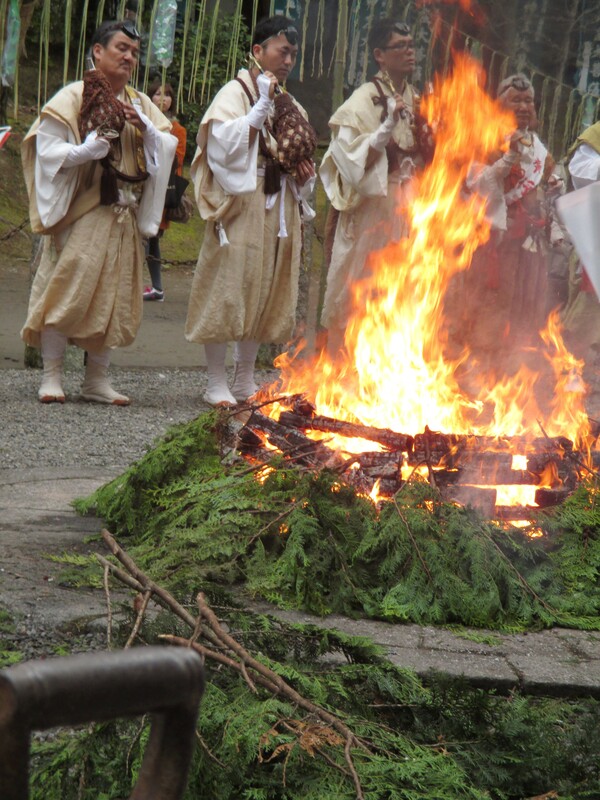 The bond fire ceremony included very stylized chanting and music with instruments that sound like shofurs. The crowd was mostly over the age of 60 and I saw very few tourists. An estimated 100,000 people attended, but nothing about it felt crowded. Any time I wanted to see something or participate in something, there was a space for me. Three women at different times kind of pushed me into transitioning from an observer to a participant. I prayed, I bowed, I listened, I slowed down. I didn’t try to lift the 300 pound rice cakes. 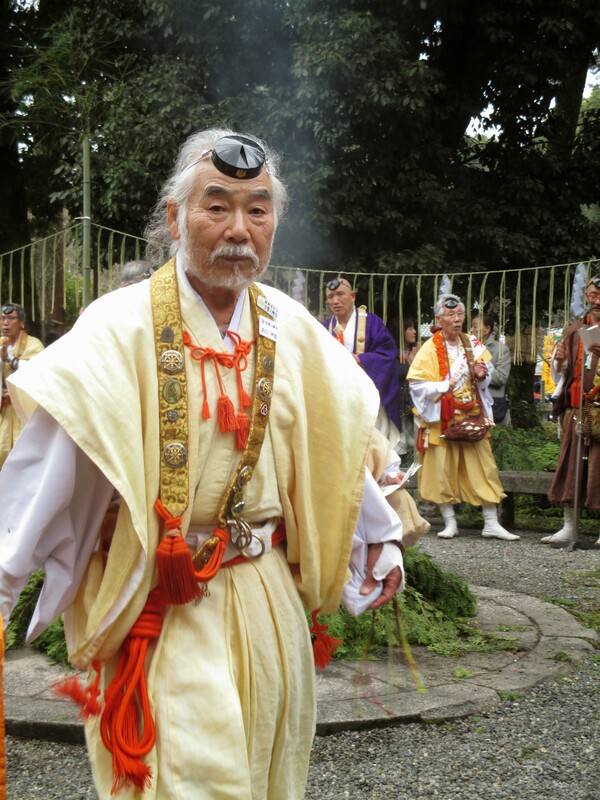 Buddhist priest in traditional dress. He wasn’t free for dinner. 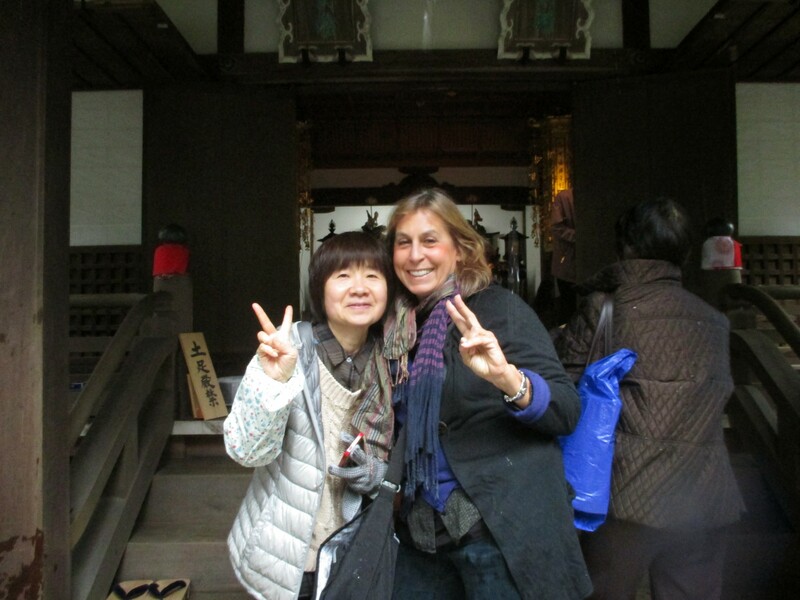 Yoshiko brought me into one of the temples, fed me, told me about the meaning of the festival and friended me on Facebook. 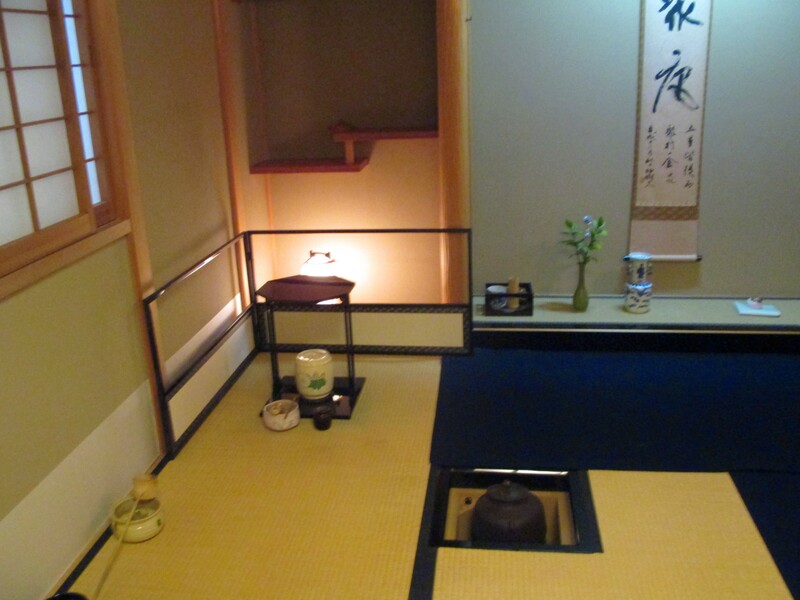 I also attended a tea ceremony earlier in the day. It was actually more of a short workshop that left me wanting to learn more. 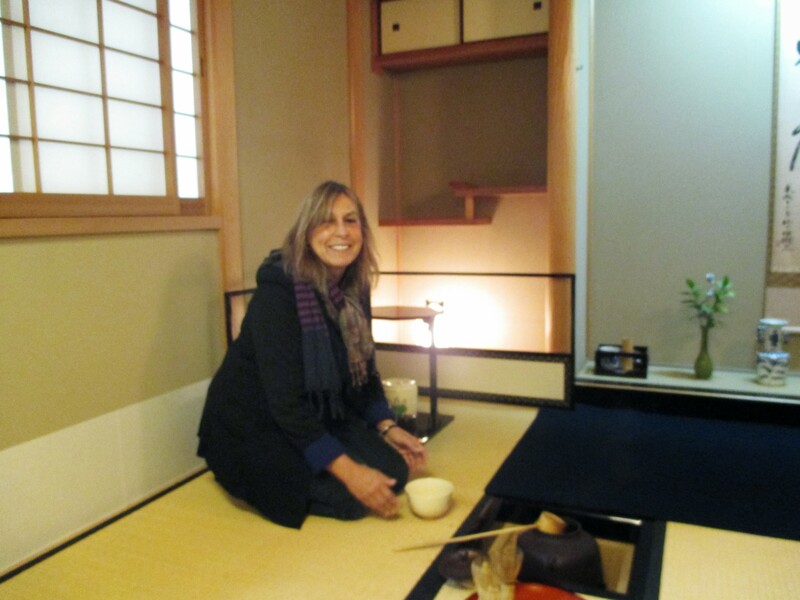 The Japanese tea ceremony is a tradition that is very complex, with many steps and specific ways to perform each of them, and each has layers of meaning (this is Japan afterall). The tea scooping spoon even has his own personal name. 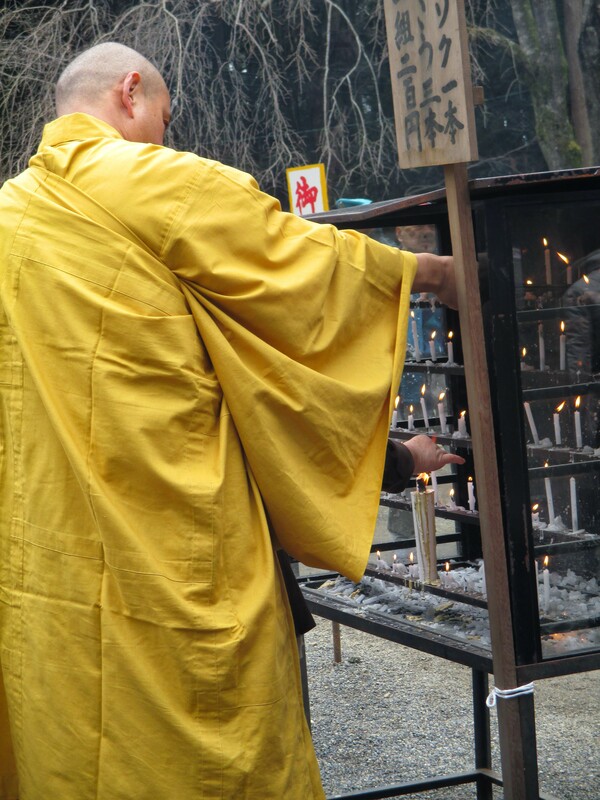 The name of ours was, loosely translated, “the lovely scent of the plum blossoms in the spring.” The purpose of the ceremony is to instill peace and harmony and it usually lasts more than three hours. 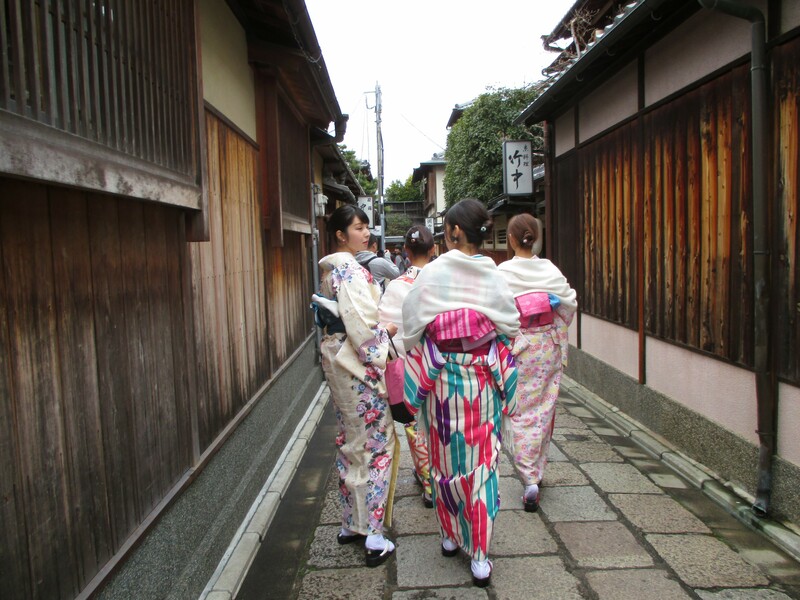 It is now most commonly performed by women, including geisha, but originally it was performed by samurai who wanted to show off their wealth and demonstrate cultural refinement. 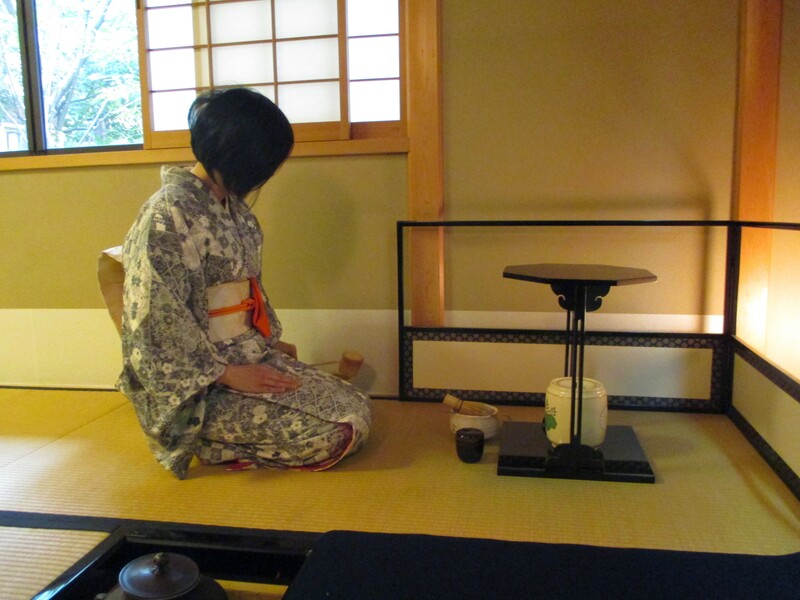 Lovely Masumi was our tea ceremony hostess. I don’t often drink green tea because the caffeine in it affects me profoundly, way more than coffee. Our tea ceremony not only featured two bowls of tea for each of us, the tea was “matcha,” which is tea that is so finely ground, you drink the leaves. I hallucinated for about six hours after that. 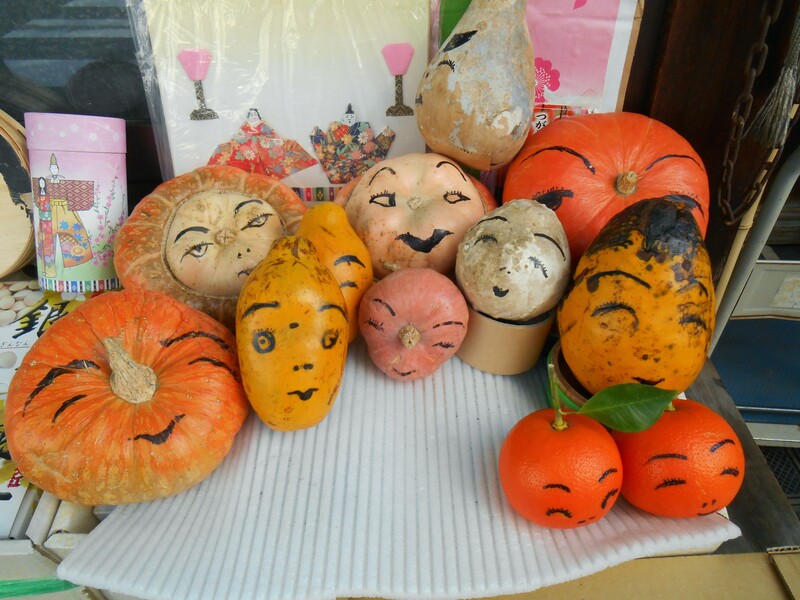 I have also visited a couple of the museums and enjoyed the kind of art that is on posters or walls or a squash. 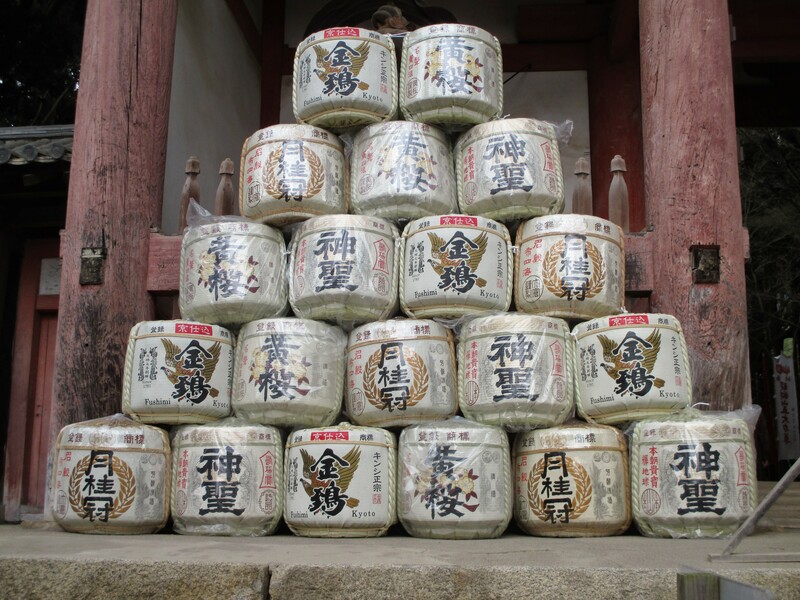 Japan seems like one big art project. 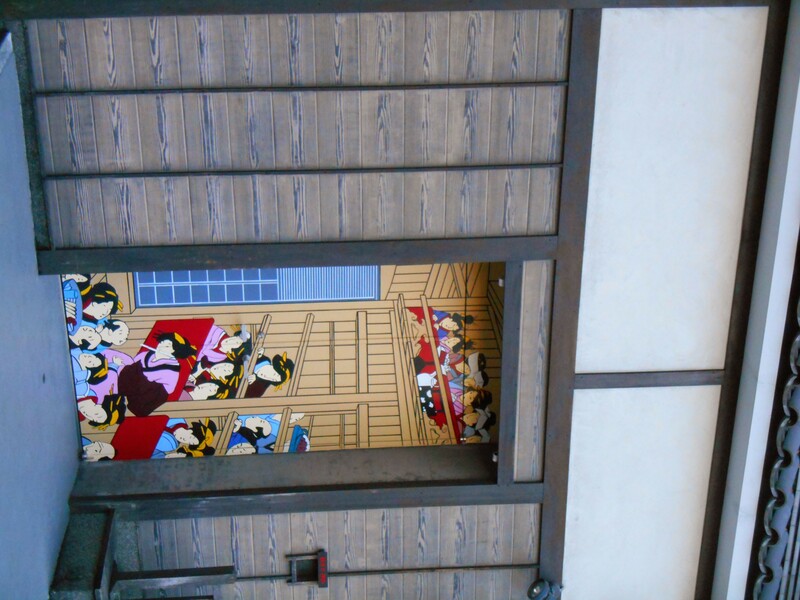 Traditional painting on a garage door. 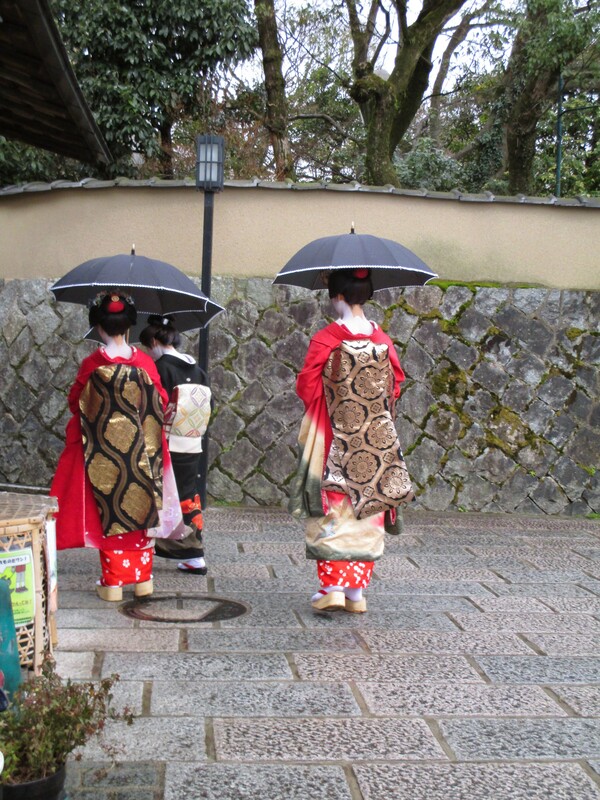 These are actual geisha in the middle of the day and this is my own photo. Geisha are very elusive. Installation by graduating art student. The project wasn’t very artistic but her spirit was. 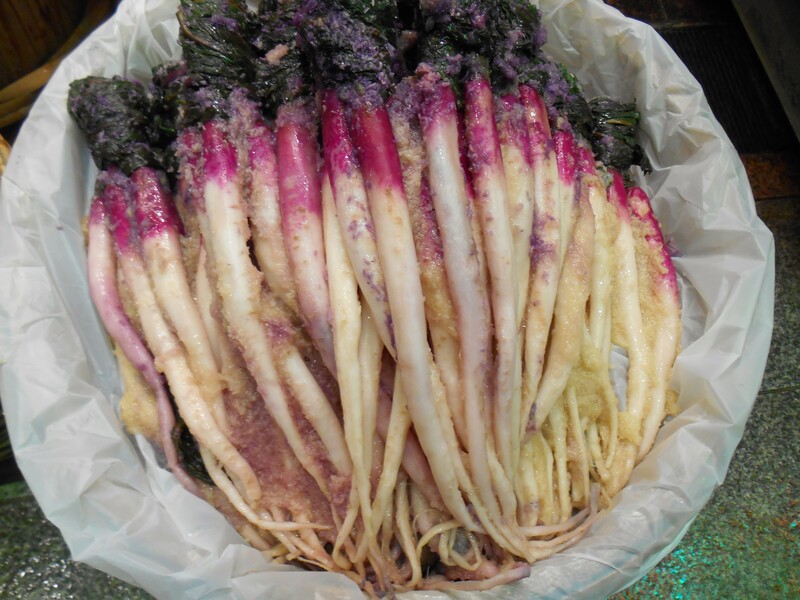 More beautiful pickled daikon. The green tops are wrapped into little buns. 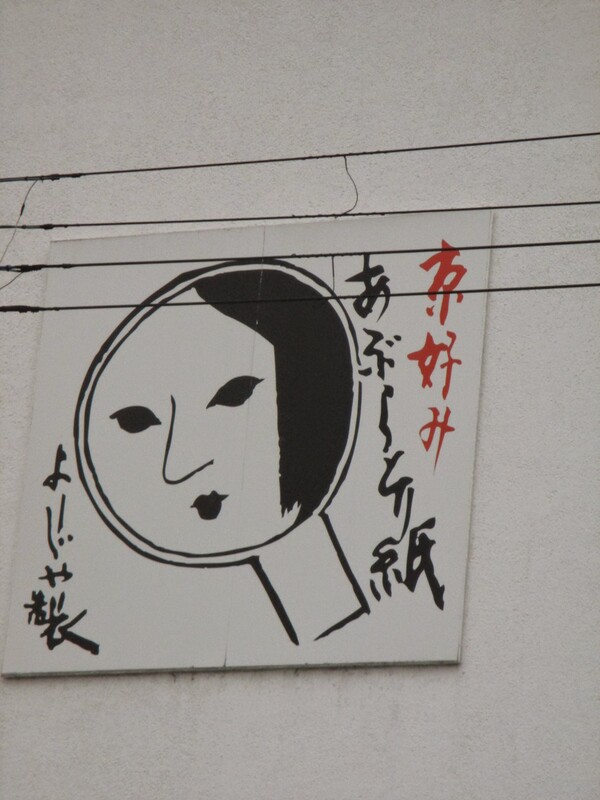 Painting on commercial building near geisha town. These schoolgirls thought it was funny that I was taking a photo of them taking a photo of the boy getting on the bike. 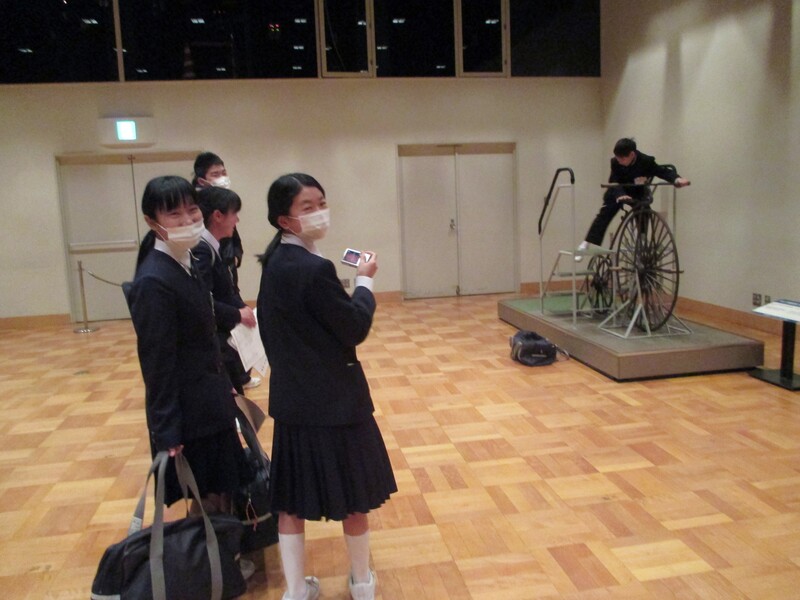 Actually this is at a Tokyo museum. Many women dress up in traditional dress for outings on the weekend. 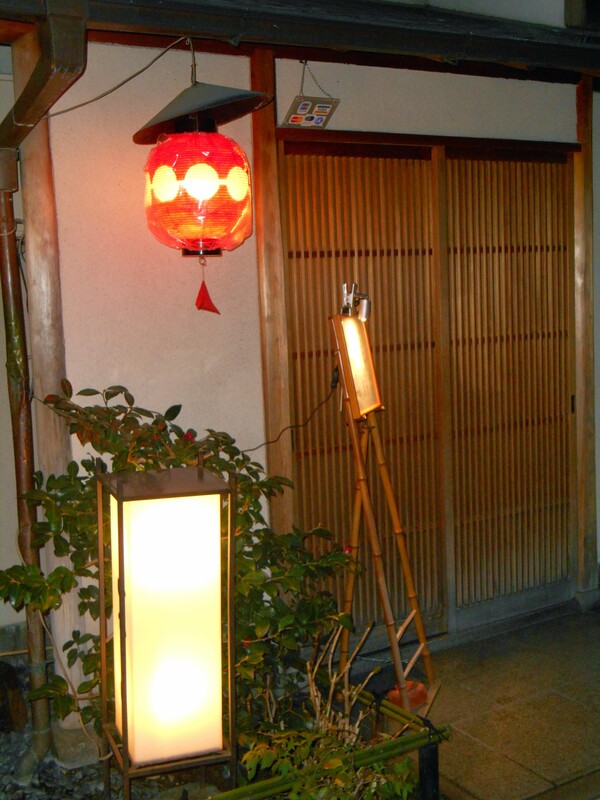 The design on the lantern identifies the geisha neighborhood. 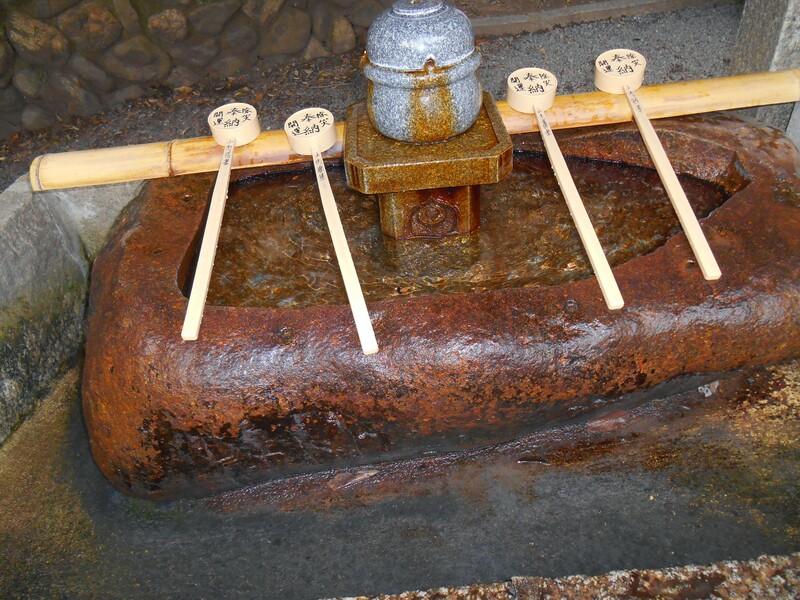 At some temples, you may purify your hands before entering. 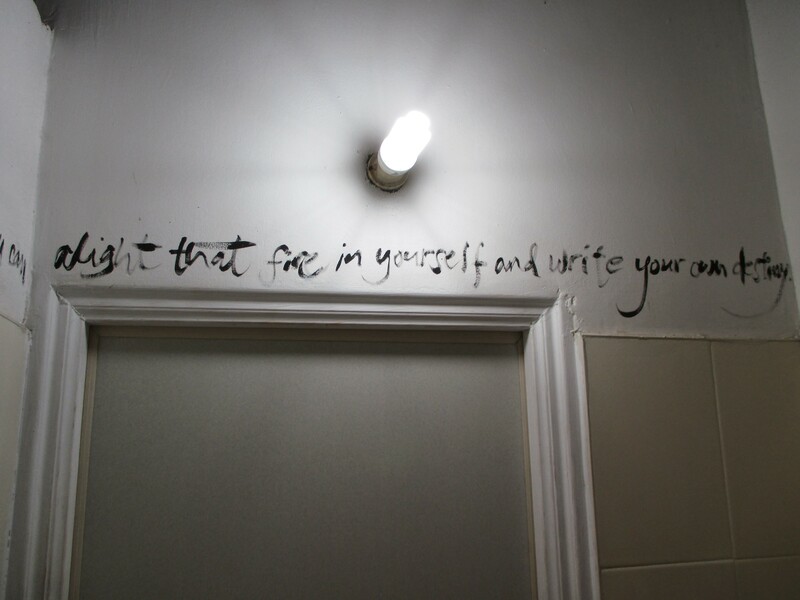 On the wall near the bathrooms. Wow! Wonderful wonderful pictures and narrative (again). 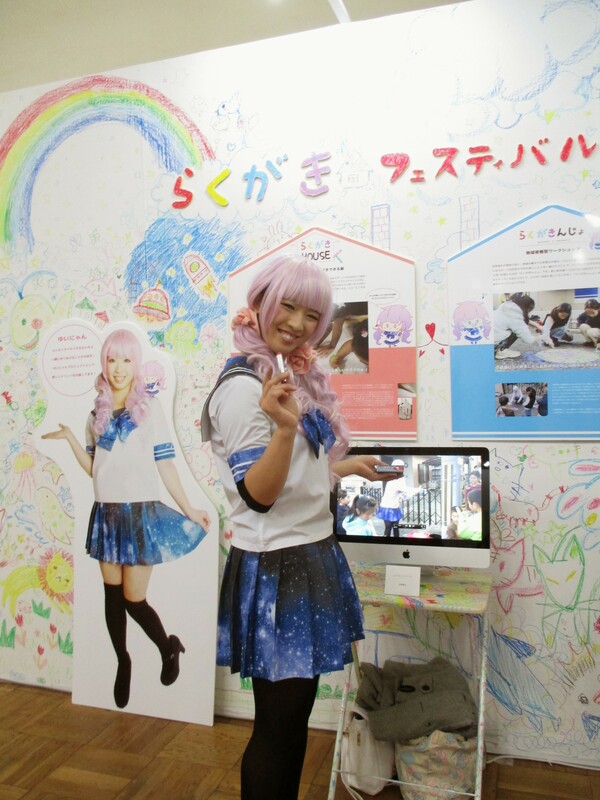 Makes me wanna’ go back to Japan! It will be interesting to see how Scottie finds it when he and Miho visit. I bet he loves it too! Where next Kim??? How are the interviews with the NGOs going? Coming home Friday to see family in Los Angeles, then back home. There are many choices for NGO work I think. Hope to see you as soon as I return!